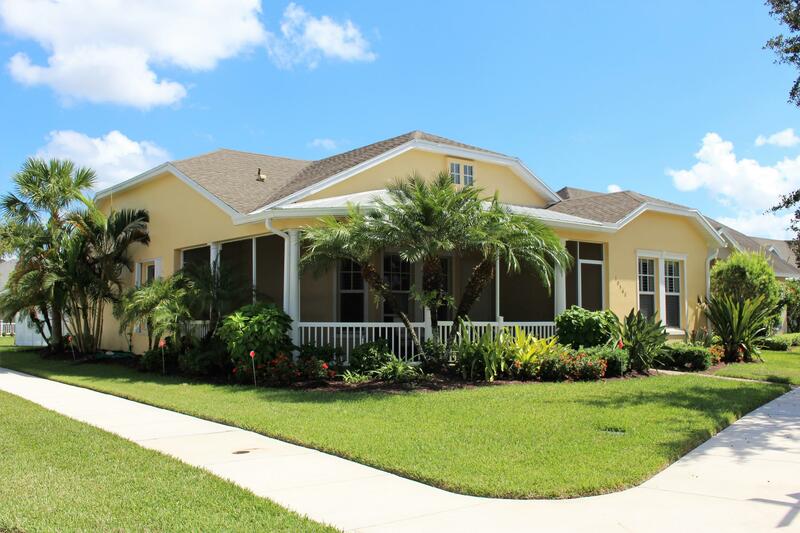 Beautiful Key West style home with inviting wrap-around front screened porch. Corner lot, across from open green space, park areas, in the heart of Tradition. Home offers tile floors through out, crown molding, newer gas water heater, freshly painted on the outside, kitchen with granite counter tops, gas stove, 42 wood cabinets & breakfast area .Hurricane impact front windows and back doors leading to porch, all other windows have accordion shutters, custom made plantation shutters, rain gutters. Master bedroom with large closet and master bath with dual sinks, tub and separate shower. Fenced back yard with mature landscaping, paver walk way and screened back patio. Detached 2 car garage. Easy access to downtown Traditon, for shoppings hospital, restaurant, club house.Buyers Home warranty.